Exterior blinds are not just manufactured for shading. Where a business is concerned a commercial blind can play a vital role in promoting your business. After all the first thing a potential customer will see is the front of your shop premises. If you dont already have an exteriour blind it maybe something you should consider. If you do have one and it's looking rather worn or damaged we can transform it by repairing and re-covering it in new fabric or plastic. Sometimes this can be just what your business needs, repainting and renewing your blind completly transforms your business and the look of it bringing more potential customers in. 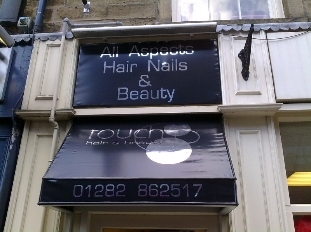 Matching Sign Boards- We manufacture these signs to compliment your exterior blind, they are made using the exact fabric and colours as the blind. We can add your logo or graphics. 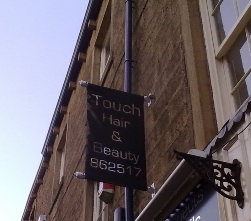 Small Vinyl Signs - Take full advantages of your sign by really promiting your business, giving a potential customer exciting information and tempt them into your business. Banners - These are fantastic for capturing a potential customers attention. They are made in house using either our re-enforced pvc or cloth to co-ordinate with your exterior blind. We offer traditional signwriting or vinyl lettering again completed in house. A Boards Or The Traditional Chalk Board - Again use eyecatching logos or graphics to attract a potential customers attention. More often than not a pavement sign can be really useful to do this as customers are walking past them all the time. Make them stop and read what your offering, make them come in people are curious if they like what they see they will buy. If you would like any further help or advice please feel free to contact us.